The 1957 Brooklyn Dodgers Minor League Ring: This ring is a gorgeous replica of the real ring that was handed to the players in 1957. This ring is carefully crafted out to resemble the original ring and the detailing it has is simply superb. This ring weighs in at 17.4 grams and it features the team’s logo and crest in the center. You can find one of these rings for around $1,750. The 1963 La Dodgers World Series Championship Ring: This ring is the authentic one--handed out to a staff member-- and it was priced at $7,999.99. This ring is a size 11 ring and features 14k of pure gold. It is quite heavy and measures 31.4 grams. This ring features a blue sapphire at its center and its details are absolutely breathtaking. The 1955 Brooklyn Dodgers World Series Ring: This ring is a delicate replica of the original 1955 ring that the Brooklyn Dodgers earned when they defeated the New York Yankees. It is made out of a fine stainless steel alloy and it also includes the Dodger’s crest and engraved lettering. The 1959 Los Angeles Dodgers World Series Ring: This replica of the original 1959 World Championship ring is made out of 14k of pure white gold and it has” Los Angeles World Champions” written across the front. 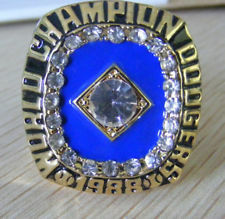 The 1977 Los Angeles Dodgers National League Championship Ring: The detailing is magnificent and it features 14k yellow gold. Owners of this ring can truly remember the victory that was associated with this ring and it is truly an important piece of memorabilia. For casual collectors, NLCS rings may not be as popular as Dodgers championship rings from the World Series, but it's hard to find. There are other Dodgers championship rings, of course, but that's just a sampling of what's in the marketplace.